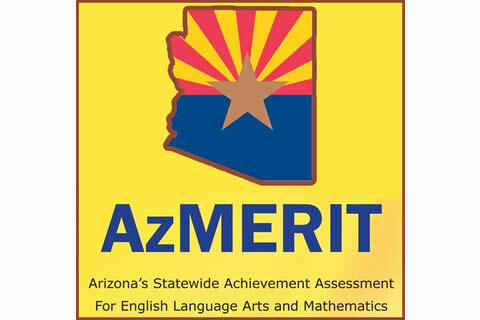 For students who achieve a score of Proficient or Highly Proficient on an AzMERIT ELA or math test, or in the Meets or Exceeds Standards scoring category on the AIMS biology test, their semester 2 grade in the corresponding English, math, or biology class at PHS will be increased on their transcript by one letter grade from D to C, from C to B, or from B to A. The student must not have lost credit for the class based on excessive absences. The student must also have earned a passing grade in that course, prior to any increase on their transcript. EXAMPLE: A student earns a semester 2 grade of C in their freshman English class, and has a total of only 4 semester absences. That student earns a score of Proficient on the grade 9 AzMERIT test. The student would have their semester 2 English class grade changed to a B on their transcript. That’s it! If you would like more information, please see the following Frequently Asked Questions. Q: Why does PHS believe that a grade-related external incentive for AzMERIT will be helpful? A: With previous AIMS tests, there was tremendous external motivation for students to do their best work on these tests. Passing these tests was previously a high school graduation requirement. Also, for several years, students who scored in the highest category on each AIMS test were offered free tuition at in-state universities. Prescott High School students historically achieved very highly on these tests. Since the test format was changed a few years ago, external incentives were dropped. Students do not need to pass any AzMERIT or AIMS biology tests to graduate, and no tuition or other state-level incentive is offered for high achievement. These tests in recent years have also substantially increased in rigor. Without external incentive to perform well, many students unfortunately do not take these challenging tests seriously. Scores have sagged statewide, as well as at PHS. Q: Is this done at other high schools in Arizona? A: Yes. A significant number of high schools across Arizona already link course grades to achievement on statewide AzMERIT/AIMS tests, in order to encourage students to do their best work on these tests. Those schools have seen student buy-in and test scores improve. PHS is catching up with what many schools have determined is best practice for their students. Q: Would this impact a student’s grade point average (GPA)? Won’t universities see this as “grade inflation”? A: When a grade is changed on a transcript, it does have a positive effect on GPA. Many schools in Arizona (along with some other states) are already taking this incentive approach. Universities are fully aware that grade point averages at different schools have differing implications. This is why admissions and scholarship committees take into account a variety of factors—essays, ACT/SAT test scores, GPA, involvement in volunteer and leadership activities, and so forth. Q: Why raise a semester class grade for an AzMERIT or AIMS test incentive? Why not offer gift cards or other prizes? A: Many schools have determined that a student who shows proficiency on these rigorous standardized tests should have that proficiency reflected in their semester grade. We are choosing to follow that established pattern. Further, using district funds for gifts for students in this way may be construed as a “gift of public funds,” which is not permitted under school finance laws. Q: What is the incentive with a year-end standardized test for a student who already has an ‘A’ for a semester grade in a class? A: All students should have incentive to do well on AzMERIT/AIMS tests, since these “year end” standardized tests are administered in April, more than a month before the end of the 2nd semester of school. Although many students may be on target for a 2nd semester ‘A’ grade, final grades are not determined until well after testing. For students who do “pass” standardized tests as well as earn a 2nd semester ‘A’ grade in the corresponding class, an ‘A’ will be posted on the student’s transcript. All students also have AzMERIT results posted on their transcript. Q: Why not also offer this incentive to a student who fails a class? A: This is not common practice at schools which have a similar incentive program. General consensus among our PHS leadership councils and faculty is that earning credit in and passing a class should be a minimum requirement for a potential grade boost based on standardized test achievement.